UNITED NATIONS, April 5, updated April 9 -- Following the military coup in Fiji in late 2006, the UN had said it would not use more Fijian troops as peacekeepers until democracy was restored. In recent weeks, New Zealand, Australia and the Commonwealth have said they have asked new Secretary-General Ban Ki-moon to implement this policy. Now it turns out that either the policy has changed, or that the policy wasn't what most people thought it was. Associate UN Spokesman Farhan Haq told Inner City Press, to his credit on the record, that the policy "doesn't effect existing deployments," including the deployment of Fijian troops to protect the UN in Iraq. Inner City Press asked for a comment on reports that 15 more Fijians are heading to Iraq on April 25. Mr. Haq called this a "rotation," but when was asked if the number of Fijian troops in UN peacekeeping service is capped, the UN's Mr. Haq said "no." So, despite what previous Secretary General Kofi Annan said, even without any move toward democratization in Fiji, the number of Fijian soldiers for which the UN pays the Fijian (military) government could go up. Earlier this week, as subsequently reported in Fiji, the head of UN peacekeeping Jean-Marie Guehenno on camera declined to answer Inner City Press' question on whether his Department is still using, or is increasing the use of, Fijian peacekeepers. Video here at Minute 30:15. Now the ongoing no-comment makes more sense. The coup as breaking news. The follow-through? Not so much. The UN seems to be claiming that no one has explicitly asked for the cessation of use, even rotation, of Fijian peacekeepers. But a spokesman for Australia's Department of Foreign Affairs and Trade (DFAT) was quoted earlier this week that "we have made our view clear about the inappropriateness of Fiji's participation... given the Fiji military's illegal overthrow of the legitimately elected government." And as noted, in January 2007, New Zealand Prime Minister Helen Clark said, "We've made it very clear to the UN that we do not believe they should be using Fijian troops." 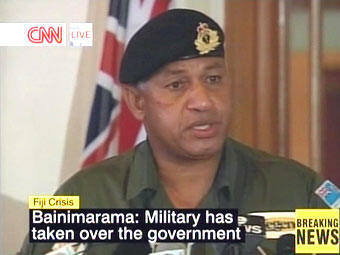 Nor has the UN responded on the record to the quote by the Commonwealth's Secretary-General Don McKinnon, that Mr. Ban said, "Don, we need these troops," nor to the claim by Fiji's interim Prime Minister -- that is, military leader -- that Mr. Ban has rebuffed the Commonwealth and implicitly validated the coup in Fiji. One correspondent wondered, Why can't the UN respond and be transparent? Another noted that Fijian troops are prized by the UN in part because many of them like to visit the Holy Land, and have done so on bus tours organized by Israel. Fiji, like Pakistan, Nepal, Bangladesh and others, makes money from its soldiers. On January 5, 2007, Inner City Press asked Ban Ki-moon's spokesperson if he would implement the statements of Kofi Annan on the use, or dis-use, of Fijian peacekeepers. "What was previously said, stands," the spokeswoman answered. Video here, from Minute 11:28. On April 3, 2007, Inner City Press asked the spokesperson to confirm or deny that Mr. Ban has changed this policy, and has told the head of the Commonwealth that "we need these troops." Inner City Press: There was a quote by the head of the Commonwealth, Don McKinnon, saying he spoke with Ban Ki-moon about the Fijian peacekeepers, and again asked him to either enforce or implement the idea that peacekeepers, following the coup, wouldn�t be used by DPKO. He said, and I'm not sure if it's true or not, "Don, we need the peacekeepers," Mr. Ban said. Did Mr. Ban say that? Spokesperson: I cannot confirm this at this point. Again the correspondent wondered, Why can't the UN just respond, one way or the other, and be transparent? We'll see. and 8 military observers (in UNMIL, UNMIS and UNMIT). 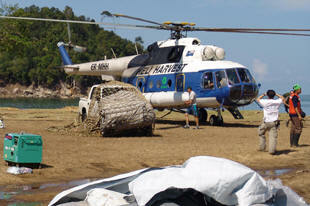 December 2006, nor has Fiji contributed to any new missions since then. normal troop rotation between April and May. Any new contribution will be evaluated on a case-by-case basis. UNITED NATIONS, April 3 -- Africa's economic future is painted, in nuanced but generally upbeat tones, in the 2007 report of the UN's Economic Commission on Africa. The report was presented Monday at UN Headquarters by Ejeviome Eloho Otobo, something of an in-house UN intellectual, who repeatedly pitched two of his publications, one in the New School Economic Review, the other a letter to the editor of the Financial Times. Inner City Press asked Mr. Otobo for his views on the economic downturn in Zimbabwe, which the ECA puts at negative 4.4% growth last year, and which the UN's humanitarian affairs office last week put at a 40% decline since 2000. Mr. Otobo ascribed the drop to "political tensions," but did not explain why political tensions in other African states, from Cote D'Ivoire to Somalia to Uganda, did not result in anywhere near Zimbabwe's decline. Video here, from Minute 36:22 to 39:32. 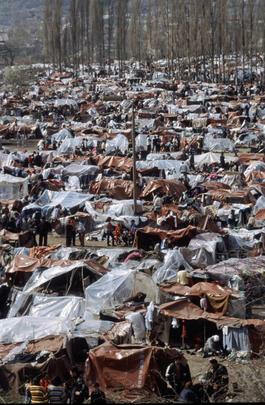 In fact, tension-wracked Sudan was one of the eight fastest-growing African countries in 2006. Inner City Press: ... while you were away, on Zimbabwe, the Secretariat�s briefer to the Council said that the situation in Zimbabwe is not a threat to international peace and security. I am wondering if that�s the Secretariat�s view, or what is your view on that? SG: We are also very much concerned about the situation in there. It is necessary for the leaders of the Zimbabwean Government to strictly abide by all democratic rules, to firmly establish democratic rules again. Click here for video. The ECA "Economic Report on Africa 2007" states, at page 32, that "only one country -- Zimbabwe -- recorded a negative growth rate in 2006." On page 39, this decline is diplomatically ascribed to "political difficulties." Inflation makes its appears on page 41: "In Zimbabwe, inflation increased to 1216 per cent in 2006 compared to 237.8 per cent in 2005, owing to inflationary financing of the budget deficit." Still, Zimbabwe scored high in tourism. The ECA report, formally entitled "Accelerating Africa's Growth and Development to Meet the Millennium Development Goals - Emerging Challenges and the Way Forward," purports to deal with the financial services sector in less than one of its 182 pages. The report's approach is surprising: "financial sector reforms have resulted in a gradual move towards market-based interest rate determination and curtailment of the government�s presence in the financial sector through privatization of government-owned banks. While these are welcome developments" -- that is, ECA unequivocally portrays bank-privatization as welcome, regardless of buying. In Mr. Ban's native South Korea, banks sold by the government were snapped up by predatory investors like Lone Star, subsequently sued for fraud. Would ECA really like to lure Lone Star to Africa? There is no discussion of the so-far seminal African bank-acquisition deal, Barclays return to South Africa by purchasing Absa. Given the report's 189 pages, this deal merited discussion. Inner City Press, in the course of reporting on another of the UN's regional economic commissions, ESCWA in Lebanon, received detailed reports from Addis Ababa regarding abuses under the 1995-2005 head of UNECA, K.Y. Amoako of Ghana, including that he unceremoniously had ejected from Ethiopia any dissenters among his ranks, family first. How these far-flung UN commissions can remain accountable and credible is a question for reform, and a question of the objectivity of their reports. We'll see. UNITED NATIONS, April 2 -- As mortars fly in Somalia, now with the involvement of mercenaries, the UN continues to point toward an April 16 summit which most predict will not be inclusive. Alongside the fighting in and flight from Mogadishu, doubts have increased about the Transitional Federal Government's commitment to involvement any of its perceived opponents, or now-disfavored clans. Inner City Press: On Somalia, it was reported that Egyptian Foreign Minister has written to the UN, AU and Arab League, asking for immediate intervention to stop the conflict in Mogadishu. I wanted to know if you have received that, what your thinking is? While sidestepping the request for response to today's fighting in Somalia, it is also unclear what efforts by the TFG are being supported. For more than a month, the UN has been asked, what is being done to encourage the TFG to reach out to its opponents? On March 7, Inner City Press submitted questions, including a request for response to a detail critique of the TFG's inclusiveness, to the spokesman of the UN Political Office on Somalia, Ian Steele, and to the address OCHA Online provides for its Somalia coordinator, Eric Laroche. The latter bounced back, and Mr. Steele has yet to respond. The UNPOS web site, at least its front page, has not been updated since January. In the midst of all this is the affable Francois Lonseny Fall. 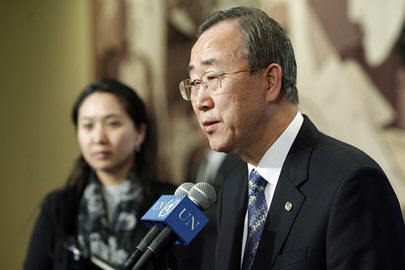 He at least took questions from the rostrum, at the UN on March 14. He said, "4.5 is very important," but only defined it out in the hall. Posts in the Transitional Federal Institutions should be given out equally to the four main clans in Somalia, with an additional "point five" to the remaining, smaller minorities. "We have no specific reaction to the statement you refer to, which was dated several weeks ago, but SRSG Fall and other members of the international community have repeatedly expressed the view that an all-inclusive dialogue is essential to peace and stability in Somalia. They continue to encourage the TFG to include all national stakeholders who have renounced violence in the National Reconciliation Congress planned for 16 April in Mogadishu." Maybe, just maybe, the April 16 Congress will cure all previous missteps. Meanwhile, the UN has stood by while Ethiopian troops took over, at least temporarily, Mogadishu, while the U.S. bombed in the south and now sends DynCorp mercenaries, and while even the UN-annointed Transitional Federal Government excludes major clans contrary to the "4.5" system that the UN calls important, without really defining. It means that the four major clans each were supposed to get equal numbers of government posts, with the remaining minorities in Somalia getting a "point five" share. It has fallen out of whack, as now helicopters are shot out of the sky. Questions will continue to be asked. UNITED NATIONS, March 29 -- After Zimbabwe was discussed Thursday in the UN Security Council, the Council's president for March, South African Ambassador Dumisani S. Kumalo, said the briefing should not have taken place. Inner City Press asked him about a statement, just made, by UK Ambassador Emyr Jones Parry, that the situation in Zimbabwe represents "a potential problem for regional stability." "We held the briefing just to hear that?" asked Ambassador Kumalo. He said no one in Zimbabwe was helped by the briefing or the politicization. Sources tell Inner City Press that inside the closed-door meeting, Amb. Kumalo apologized to the UN Secretariat's briefer, Rashid Khalikov of the Office for the Coordination of Humanitarian Affairs, for having him in the Council instead of some other, purely humanitarian venue. The UK asked for the Zimbabwe briefing, which was scheduled for last Thursday, March 22 but got bumped by the Iran nuclear sanctions resolution. The rescheduled time ended up not working, Amb. Jones Parry said, because the requested briefer was "away on mission." Therefore Rashid Khalikov on March 29 was the choice, under the rubric "Other matters." Following his briefing, Mr. Khalikov took questions from reporters. 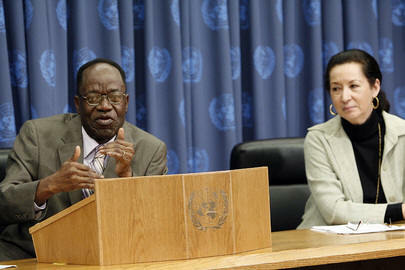 Surprisingly, he said that he does not view the situation in Zimbabwe as a threat to international peace and security. Most briefers decline to opine on such political questions, since the jurisdiction of the Security Council turns on precisely this test. Since Mr. Khalikov's (new) boss is John Holmes, previously a UK diplomat, it is foreseen that Mr. Holmes, upon his return from his visit to Sudan, Chad and elsewhere, will be asked for his views on the briefing, and on Zimbabwe more generally. Speaking of Chad, Mr. Holmes on Thursday was quoted both that the international community is underestimating the problem, and that no UN force can be sent in absent a political solution and a "peace to keep." Inner City Press: I saw that the Deputy Secretary-General is slated to meet with the Permanent Representative of Myanmar later this afternoon. And I'm wondering what's on the agenda, and whether, in light of Special Rapporteur [Paulo Sergio] Pinheiro's call for the release of political prisoners, whether Ms. Migiro will be raising that or other human rights issues? Associate Spokesperson: We don't often get readouts of meetings that are held with the Permanent Representatives here, of which there are many. But I'll see whether we can get some information once that happens. Inner City Press: I know there's been a request for some time to have Ms. Migiro either do a briefing here or maybe they were going to do it at the United Nations Correspondents Association (UNCA) Club. Where does it stand, to actually hear from Ms. Migiro? Associate Spokesperson: She's certainly willing to meet with you in a number of venues. I don't know what the arrangements are, whether it's here or in UNCA for the next one. Inner City Press: I guess I would like to reiterate that invitation, on behalf of UNCA. I just think it's time. The other question I have is: there were these announcements about what they call the mobility posts. There's about a dozen, maybe, that were announced with some fanfare. Mr. [Vijay] Nambiar said there were 1,200 applications. What is the status of those? Some people are saying that some of the posts have been given out. Is that the case? Associate Spokesperson: I'm not aware that any of them have been given out. Certainly none of them have been announced. I know that I've been looking with interest, to see whether those posts have been filled. But as far as I know, they're not. Inner City Press: Will they be announced when they are filled? Associate Spokesperson: I imagine so, yes. I don't think all of them will be announced, because many of them are fairly low-level. I imagine the higher-level ones would be announced, as we normally do with high-level posts. The UN Secretariat can issues statements and calls on human rights and suffering in member states, but not bring the issue up or talk about it when these states' Ambassadors come in for meet and greet. Earlier this week, DSG Migiro told Inner City Press she wants to do a briefing. This would be the time. In other Security Council action, most of Thursday was spent negotiating a mere two-paragraph press statement on the 15 UK soldiers in custody in Iran. In the late afternoon, the U.S. mission's Rick Grenell said, on the record, "we are irritated," that if anyone questioned the need for Security Council reform they should consider this example, and to expect the U.S. Ambassador to come out and call the whole thing a "joke." U.S. Amb. Jackie Sanders emerged and predicted that nothing would be accomplished or resolved any time soon. Minutes later, the press statement was agreed to. To one reporter, Jackie Sanders subsequently explained that things got easier once she left. After six hours on two paragraphs, some said they could understand this apparently breakdown in communications. UNITED NATIONS, March 2 -- Jump in and take a side. That was the message of Eric Laroche, UN Humanitarian Coordinator in Somalia, speaking to reporters on March 1. Mr. Laroche chided most "international NGOs" for not being where the humanitarian problems are. He urged the media to stop referring to the Transitional Federal Institutions, restored to power by the Ethiopian Army, as a weak government. "Call it the to-be-strong government," he said, adding that "today there is no other alternative to chaos than to support the Institutions." Inner City Press asked about a letter from French NGO Action Contre La Faim which decried the UN's blurring of humanitarian needs and "other political agendas." Video here, from Minute 52:24 to 55:20. "Are you the one who asked the Secretary-General?" Yes. "I am happy to answer to you." Mr. Laroche said that humanitarianism and politics are very difficult to separate. "If I want to have more victims today, I just drop the [Transitional Federal] Institutions and we go back to chaos," he said. He added that even the 8,000 peacekeepers called for in the Security Council resolution would be barely enough. The four thousand actually slated to deploy will not be enough, he said. "Forget about it. It is not enough." Video here, at Minute 52. Mr. Laroche told the media to "stop saying that the government is weak, because I don't think that it helps." Several reporters pointed out that they aim, or should aim, to report how things are, not how they might be in the future. Mr. Laroche countered that "as weak at the Institutions may appear to the Somali people or to you, there is no other way today." He acknowledged that this government remains based in Baidoa, and that Somalis are fleeing Mogadishu as it has re-descended into chaos. He spoke of a TFI-sponsored conference in April and said that elements of the Islamic Courts Union might or might not attend. Mr. Laroche appeared to take no position on whether the ICU should be included. One wondered, if the UN so unequivocally embraces the Transitional Federal Government, why should it speak to its perceived enemies? Even Francois Lonseny Fall, the UN's other man in, or about, Somalia, says that there should be a process including the moderate elements of the Islamic Courts. Ban Ki-moon has given the same answer. And so while freelancing Indiana Joneses are always appreciated, this may be a sidebar version of Jan Egeland meeting with the Lord's Resistance Army. And it may be a one-off. Mr. Laroche doubles as the UN's humanitarian coordinator and, it is said, UNDP's resident representative in Somalia. He long worked with, and reportedly remains connected to, UNICEF. He is the UN in Somalia, and he is taking sides. This is described as the desired future of the UN "on the ground" -- a single decision maker who fuses (and perhaps misuses) all humanitarian and development programs of the UN. UNITED NATIONS, February 7 -- Should the UN in Somalia now help train the police force of a government carried from Baidoa to Mogadishu behind a phalanx of Ethiopian troops? The question is raised by a recent exchange of letters between the UN's Eric Laroche and the Paris-based NGO Action Contre la Faim, ACF, obtained Wednesday by Inner City Press. ACF states that it currently has "a team of 90 Somali employees and five to seven expatriates permanently based in the field... implementing humanitarian projects in Wajid supporting more than 20,000 people [and] 2000 other Somali employees running health and nutrition activities in Mogadishu for more than 5,000 people per month, with the support of expatriates who visit them as regularly as possible." The trigger for ACF's January 21 letter was Laroche's exhortation, as now stated on the Internet, that "there is now a window of opportunity in Somalia to establish some degree of governance, law and order." "the press release states a range of various activities prioritized by the UN which mix for example the 'training of police', 'the demobilization and reintegration of militias' and the 'provision of urgently needed basic social services.' ACF is fully aware of a general trend by governments and the United Nations to develop integrated, coherent policy approaches to international conflict and instability, combining political (and sometimes military) and aid instruments. But we wish to alert OCHA about the real risks created in the field by mixing the need for humanitarian aid and other political priorities. 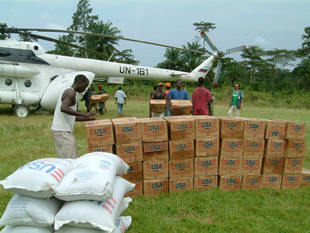 Besides inherent challenges, in this complex context, quick intervention in inadequate conditions or misperception by local actors of the impartiality and political independence of humanitarian workers may simply put the latter in danger and hamper humanitarian access and assistance to the populations in the short term and in a durable manner. These precautions are even more relevant given the current tense security context in Mogadishu. Humanitarian aid must be solely based on the needs of the population and strictly guided by humanitarian principles, especially impartiality and independence. One could expect that, given its specific mandate, OCHA and the Humanitarian Coordinator could strengthen the necessary distinction between humanitarian activities and any political agenda." Inner City Press: Thanks, and also, referring to a letter by the NGO "Action Contre la Faim" to Eric Laroche, the Somali representative of the UN, basically criticizing Mr. Laroche for siding too clearly with the Ethiopian incursion and sort of taking almost a US side. I want to know if there�s any response to that analysis and if it can be confirmed that the letter was received, and what response is being sent? Spokesperson: I cannot confirm this at this point. I don�t have any information on that. Inner City Press: Can you get confirmation on that? "Yes, there was a letter from Action Contre la Faim to the Humanitarian Coordinator in Somalia (Eric Laroche). ACF was discussing its views on priorities for humanitarian action in Somalia and their take on the current security situation. There was nothing in the letter that remotely suggested Eric was 'siding with the Ethiopians.' Eric has now responded, reaffirming the UN position that there now exists a window of opportunity to reengage in Somalia on a humanitarian level." The UN did not provide a copy of Mr. Laroche's letter, much less of ACF's. But on February 7, Inner City Press obtained both. The ACF letter does, at least "remotely," suggest that by "training the police" in Somalia -- which has in the past two months faced an incursion by Ethiopian troops with American support, and American gunship attacks on southern Somalia -- the UN is "mixing the need for humanitarian aid and other political priorities" raising questions about "impartiality and political independence." The ACF letter cannot legitimately be characterized as a discussion of "priorities for humanitarian action," because it characterizes some of the UN's stated priorities as not only not a priority, but as inconsistent with humanitarian action. It's a debate that needs to be had, but one that the UN appears to want to prevent or to sweep under the rug. Mr. Laroche's response does not fully address the issue. Laroche argues that training the forces of the Transitional Federal Government might increase security and humanitarian access. Time alone will tell if this argument is true. But it is an argument, being made by the UN in the field. After Wednesday's noon briefing, Inner City Press sought an answer to these questions from the Office of the Spokesman staff who had written that "there was nothing in the [ACF] letter that remotely suggested Eric was 'siding with the Ethiopians.'" This staffer said, "I can't give you the letters," and then seeing that Inner City Press had them, added "I've said all that I can about them." While it may not be necessary to say, this spokesman is otherwise helpful and civil and more, even on Wednesday, for example, on a question about Abkazhia. Mr. Laroche's previous work, in Congo-Brazzaville and elsewhere, has been widely praised. But why would UN headquarters want to muffle its field workers' arguments and the debates with civil society of which they are a part? Developing.